The Elephant Festival begins with a procession of elephants painted and tastefully attired with expensive gems and embroidered velvets, followed by folk dancers who with their lively performance along with the program of Dhaph and Gair dance which projects the spirit of Holi, all this together put the mark on this occasion. The elephants greet the visitors, offer garlands to the guests and walk past the ramp before a jury of experts and tourists who select the best amongst them for the "Best decorated Elephant" Shield. Elephant races and polo matches are special features. The tug of war between elephants and men is probably the most hilarious highlight of the festival. The unique "Gaj Shringar" exhibition displays everything connected with the elephant-ornaments, textiles (Jhoo), howdahs and carriages, paintings, medicines and food. The visitors have an opportunity to mount the elephants and play Holi or polo with them. Participants dance with great vigor – the excitement rises to a crescendo. Along with the Elephants there are lancers on horses, chariots, camels, cannons, palanquins, etc which takes part in the festival. Where the ornaments, textiles,etc which are related to the Elephant are displayed. Live performance of folk dancers with the programme of Daph and Gair dance which depicts the joy of Holi Festival. Here they walk pass the ramp in front of the guests for the shield of ‘Best decorated Elephant’. Dressed in saffron and red turbans, the teams try to score goals with long sticks and a plastic football. The tug of War between Elephants and men is held which is very. The visitors take part to mount the elephants and play Holi. 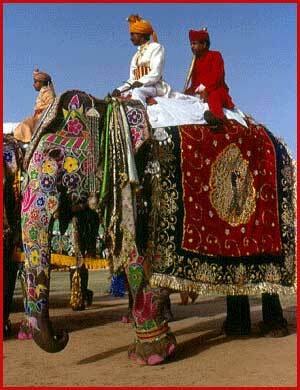 Therefore, the Mahouts take great privilege to decorate the Elephants on this particular occasion.